In 2008, the winner is the same as in 2007. Phil Taylor looses his first match of the tournament to Andy Jenkins, but he more than makes up for that defeat in his remaining group matches. For the first time, there is also a lady participating in the tournament this year. The Lakeside champion Anastasia Dobromyslova looses all her matches, but Wayne Mardle surely got a big scare, he wins by the smallest of marges; 5-4. Four Dutch players participate in 2008. Raymond van Barneveld, Michael van Gerwen, Vincent van der Voort and Niels de Ruiter are the lucky ones, but only Van Barneveld goes through to the second round. In the second round he beats the American Darin Young, but one round later, Terry Jenkins prooves too strong in a deciding leg. Jenkins will reach the final, but it was Taylor again who is too strong. James Wade gives this tournament it's first and only nine darter. 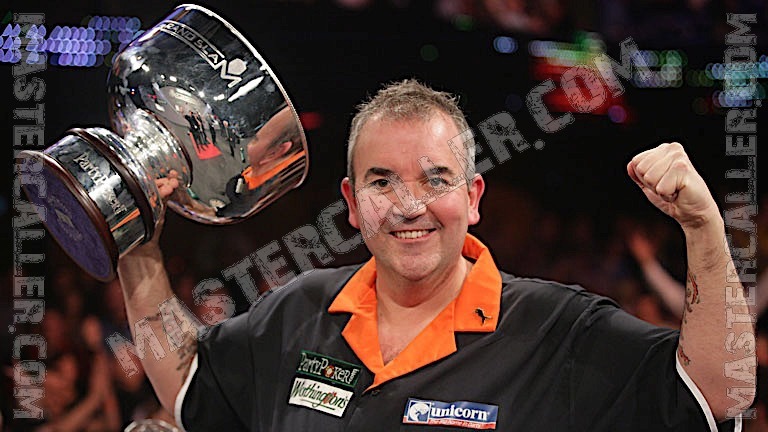 He does so in the second round against Gary Anderson. It doesn't help him to go further in the tournament because he looses that match.